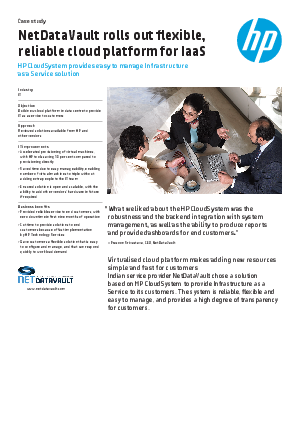 Indian service provider NetDataVault chose a solution based on HP CloudSystem to provide Infrastructure as a Service to its customers. The system is reliable, flexible and easy to manage, and provides a high degree of transparency for customers. This case study outlines the challenges experienced, the solution provided and the benefits experienced in using HP CloudSystem.